Dec. 17, 2010: Mohammed Bouazizi, a 26-year-old Tunisian vegetable seller set himself on fire after a policewoman confiscated his unlicensed cart and spat on him after he refused to pay a fine. Bouazizi's act and the socioeconomic situation it highlighted spawned anti-government protests across Tunisia, and one month later, the 23-year rule of Tunisia's Ben Ali came to an end. Demonstrations subsequently spread across the Arab world, successfully toppling Egypt's Mubarak, bringing war against Libya's Qaddafi, and an ongoing uprising against Syria's Assad. July 14, 2011: When 25 year-old film editor Daphni Leef was evicted from her Tel Aviv apartment and found herself unable to find an affordable alternative, she decided to pitch a tent on one of the city's most luxurious boulevards, and invited her friends to do so as well via Facebook. Three weeks later, more than a quarter of a million lower- and middle-class Israelis marched across Israel demanding a new economic order and a reeling back of imported capitalism in favor of the ideals of a welfare state inherent in the nation's historical revival. Nearly one month after the first tent was pitched, thousands of tents have sprung up in improvised tent cities across the country--some inhabited by idealistic students, others by families claiming they have hit rock bottom--a situation no humane government can ignore for long. Plans are underway for a million person march in September--proportionally speaking, the equivalent of 45 million Americans on the streets. August 4, 2011: Mark Duggan, a 29-year-old father of three, was shot dead by police officers of Scotland Yard's special black-on-black crime unit. Fifteen minutes prior to the shooting, Duggan sent a message from his blackberry saying "the Feds are following me". Two days following the shooting, a group of around 200 of Duggan's relatives and local residents of Broadwater Farm marched to the Tottenham Police station to inquire into the circumstances of the man's death. After waiting hours to speak with a higher-ranking officer, the mob became impatient and set two nearby police cars on fire. 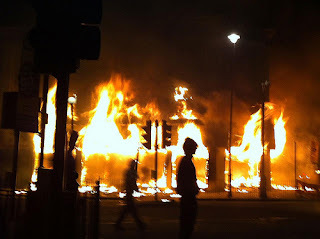 Rioting, looting and arson spread throughout London and other cities around England, striking a chord among working-class Britons alienated by a society burdened by budget cuts and lurking xenophobia. In a country once marked for its obsession with order and the rule of law, police across the Kingdom have admitted that they are not able to regain control of Britain's streets in the face of "unprecedented" levels violence. What do all three phenomena have in common? All three began with one incident involving a "random" citizen in their 20's whose life circumstances and/or reaction to them incited a generation, a country or a region to radically and abruptly shift the balance of power between people and government. In much of the Arab world, citizens seeking democratic government resorted to violence in the face of a tyrannical ruler with a military backing. In Israel, protests have thus far been peaceful demonstrations aimed at toppling the current government or radically changing the society's priorities. In Britain, the uprising has stemmed from a class of people who fail to find means within the democratic system to voice their grievances. Secondly, the internet has played a major role in all three social phenomena. One small event takes on larger-than-life proportions with the help of social networks and instant communication and distribution of information, proving that the Facebook generation are only glued to their touch screens until further notice. In response, governments and law force agencies understand they must play the same game in order to suppress/restore order, using tactics such as shutting down internet and cellular networks such as in Egypt and Syria, or pressuring cell phone companies to provide sensitive information on large numbers of customers' call logs, messaging activity and contact lists such as in Britain most recently. Third, all protests reveal what governments have done their best to hide--no politician, in any part of their term, wants their population to realize that global food prices are rising, regardless of legislation. Europe is facing zero or negative economic growth prospects, and governments across the continent are cutting left and right in an attempt not to lose all. The effect of months and years of government cuts is not sudden but rather gradual--the breeding of generational economic hardship--relative to years past--that lies dormant until the match is lit. Surely, the context, legitimacy and desirability of these uprisings vary widely, and many will say there is no room for comparison. No one can deny, however, that governments across the world are standing aghast at the power of their populace to mobilize and challenge the conventional rules of the game, with consequences no short of havoc, revolution or prelude to world war. None of the above phenomenon are anywhere near their climax, and none have abated without tossing embers nextdoor. In coming weeks, let us remember that Jerusalem lies not only at the geographical intersection of Europe and Asia but also at the heart of two typologies of uprisings, and that just as what happens globally is bound to ripple in Israel's bays, so Israel's waves can be a beacon for the human spirit seeking the air of freedom and dignity, in any language.